May 26th, 2018 at 9:00am — The Annual Plant Sale on the Village Green in Leland is on tap for Memorial Day Weekend! 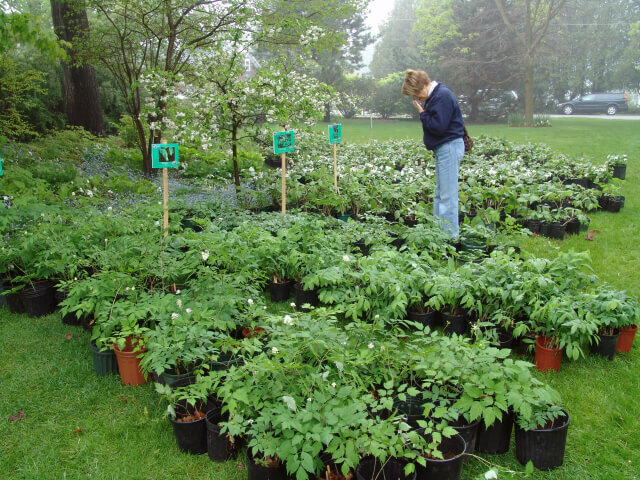 Now is your chance to purchase native ferns, trillium, and more along with a selection of native trees and shrubs provided by locally owned Four Season Nursery, who will be on hand to answer questions about going native. Sale runs Friday, May 25th and Saturday May 26th; hours 9 a.m. to 4 p.m. each day. All proceeds help maintain the Village Green and assist with other Conservancy projects. The Wildflower Rescue Committee continually seeks new sites on which to dig. If you are building a home, driveway, addition, or know of someone who is, please contact the WRC so they may have a chance to remove these precious wildflowers before the excavators arrive! Contact chair Joanie Woods: 256-7154 or call the Leelanau Conservancy: 231-256-9665.